Sharon Evans runs our grooming parlour at Pets World Kent. Highly qualified, with years of experience and countless trophies to her name, her high standards shine through her professional dedication. She looks forward to welcoming her four legged clients and their owners at our fully equipped, modern salon. 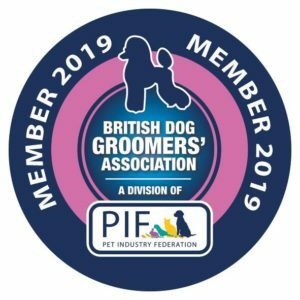 Tools you may find helpful to keep your dog well groomed in between professional grooming appointments – You will need to invest in a good Slicker Brush. These are the type with a plastic or wooden handle and small stainless steel bristles; they will keep most if not all long-haired breeds of dogs well groomed and tangle free. It is also a good idea to invest in a stainless steel comb to thoroughly comb through the brushed area to ensure all matts and tangles are removed. You can purchase these items from the Petsworld’s Pet Shop out at the front. How to use your grooming tools correctly? To get your pet into a regular routine, it is advisable to place your dog onto a raised surface. This signals that it is grooming time and not a time to play. Being on a higher surface removes the dog from its territory, the floor. Using a slicker brush, gently work through the coat removing any matting or tangling. Grooming your pet for approximately 15 minutes a day will ensure this is a pleasurable activity. ALWAYS reward your dog with praise and the occasional healthy treat for their co-operation and good behaviour. Can I cut my own dog’s nails? Dog’s nails do not need clipping on a regular basis, especially if your dog is walked on the pavement. The pavement acts as a natural nail file and keeps the nails short. Dogs that are walked regularly on grass, however, will need some attention approximately every month. Even though it is possible to trim the nails at home it would be advisable to have this done professionally at a grooming salon or veterinary clinic. There is a vein that runs through the middle of the nail called the Quick, and it is possible to clip the nail too far and cause it to bleed. Can I pluck my own dogs ears? Some breeds of dog grow hair inside the ear. It is possible that this could cause an ear infection if it is not removed on a regular basis. We would always recommend this is done professionally. How often should I bath my Dog? 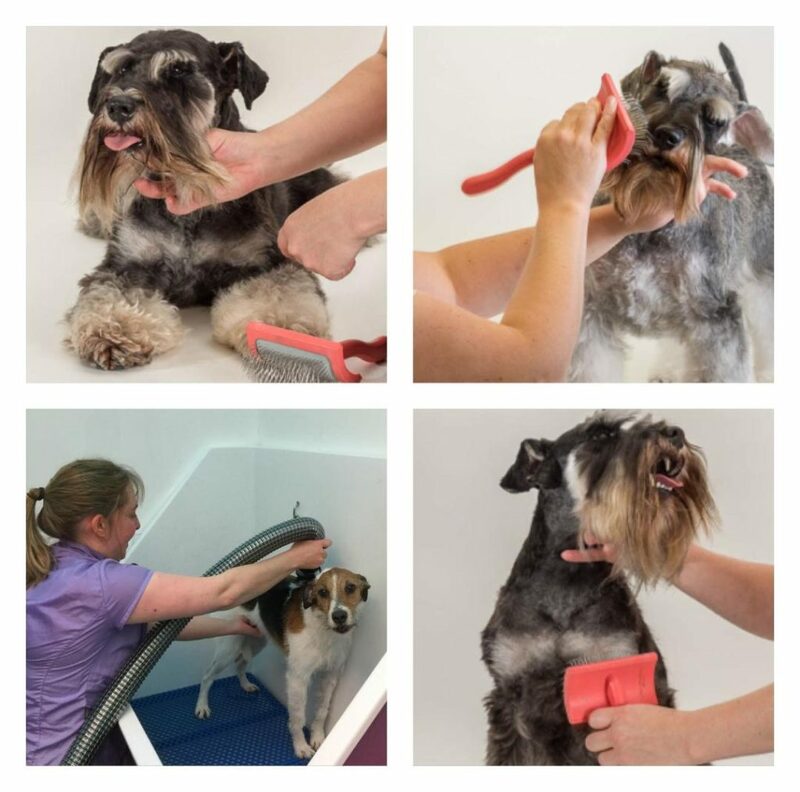 In between professional grooming sessions you should only need to bath your dog three to four times a year. However we all know that sometimes it is unavoidable when your dog has been playing in the biggest, muddiest puddle and is covered in dirt. If this is the case then when bathing your dog always use a mild dog shampoo, ensuring that the coat is thoroughly rinsed. You can purchase these items from Pets World Shop at the front. Is there anything I can do to keep my dog smelling Clean and Fresh? There are many commercially available grooming products to help maintain a clean, healthy and shiny coat. Always exercise caution with any product to prevent an allergic reaction. 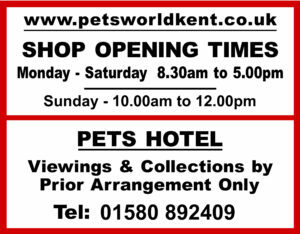 These can be purchased from Pets World Kent. My dog’s eyes seem to weep a lot and are stained brown? A dog’s eye is prone to dirt, especially in the corners. We would recommend this is removed in a regular cleansing routine using warm water and cotton wool. In certain cases, the eye can become stained orange-brown which regular cleansing can help to prevent this however if you are not sure always consult your vet. My Dog has a dry coat and seems to have dandruff what can I do? In some rare cases, dogs do suffer with skin problems. Symptoms generally manifest themselves as a dull coat and in some instances the skin will appear to be flaky and will also irritate the dog. It is always advisable to seek professional advice from your vet in these cases. Your Dog – ALWAYS reward your dog with praise and the occasional healthy treat for their co-operation and good behaviour! Exercise your dog early in the morning or late at night. Since these are the cooler parts of the day, this will make the walk more comfortable for both you and your dog. Dogs still need to be exercised regularly, but just when it’s cooler. Also remember pavements get very hot and may burn your dogs pads. Keep your dog hydrated! Different dogs have different needs when battling the heat. Keep in mind that darker coats absorb more heat than lighter coats. Also, overweight dogs are at higher risk of dehydration. Carry a bottle of water when going on a walk with your dog. Let your dog dig! Your dog may resort to finding his own way to avoid the heat. Dogs in nature dig their dens not out of frustration but to find food, hide, give birth–or keep cool! If it’s possible, locate a shady area where it’s okay for your dog to dig. Let your dog check the weather. Dogs don’t have the Weather Channel, so they don’t know why they are being denied a long walk for the day. Allow your dog to step outside and feel for itself that it is too hot, too wet, or too cold to go on a long walk. Instinctively, the dog will understand that it has to shorten its walk, or simply come back inside where it’s safe. Never leave your dog in a parked car. The car retains more heat than an open area, even if it is in the shade. Plus, a dog may get overexcited in the car due to passersby or panic from claustrophobia, making dehydration more likely. On longer trips, make sure you have water for the dog and keep the AC running. Use hot weather as an excuse to swim more often! The best activity you can do in summertime or hot weather is swimming. Instead of walking the dog, take the dog for a swim!